Ahh...That bean bag is news-worthy! AHH! Products is THE one-stop-shop for high-end quality and style in bean bag chair furniture. American and international top designers, interior decorators, celebrities, schools, libraries, hospitals, television shows, corporations, and consumers all come to us for upscale bean bag furniture. "Rooms Planned To Hold Their Attention"
"Some children have trouble concentrating. Sometimes a bean bag chair, or a desk to stand up at, can help. Read about home strategies to help kids focus..."
"Full of Beans - Play, Jump, Curl Up...Beanbags are Back!" "Take a running jump into the world of beanbags." AHH! 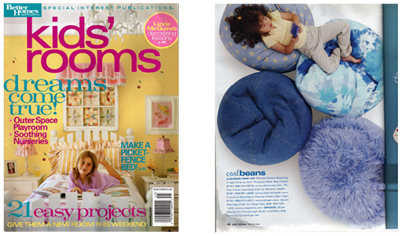 Products is featured in this Better Homes and Gardens special publication. "Where to buy a bean bag online"
"One of our favorite bean bag companies is AhhProds.com (as in "ahhhhhh..."). They only sell their custom-made bean bag chairs direct. They come with washable covers and water-repellant liners, and last for years. Their bean bags come in two parts - the inner core, or liner, made of lightweight, super-strong, water-repellent microfiber (like a windbreaker, waters beads up and rolls right off it, protecting you from spills), and the outer shell is handmade and double stitched, completely washable to protect your beanbag from spills and stains. The inner core also has a child resistant zipper - if you've ever tried to pick up the tiny spilled pieces of beanbag fillings, you'll know why this is important! Ahh Beanbags come in a round shape, not an oval or pear shape. Their bags come in four sizes: 27", 32", 37" and 52". 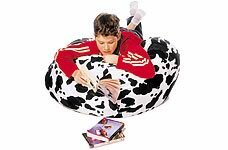 The large 52" beanbag is the size of an armchair and holds 18 cubic feet of filling, while the 27" one is small enough for small children or as a footrest." "AHH! Spot: The Ultimate Bean Bag Store"
"The mere thought of bean bags often brings a lot of warm, fuzzy feelings to many people who own one. And why not? Bean bags have easily become one of the most well-loved piece of furniture that you can easily find in countless American homes. People from all ages and social class share the same opinion and adoration to the seemingly unassuming design and simplicity of their dependable beanie. In Fairfax, Virginia, there is a bean bag store that is catching the interest and attention of many bean bag fanatics. From its humble beginnings as an ordinary manufacturer of bean bags, The Ahh! Spot rapidly became the ultimate bean bag store widely recognized in America today. It started its operation way back in 1998, and was the very first manufacturer who introduced removable and washable bean bag covers that are made of water impermeable micro fiber inside layer. It caused a quite a rage in home furnishings industry, and unsurprisingly enough many manufacturers have tried to imitate the Ahh! Spot products. However, the ultimate bean bag store was way ahead from the rest of the pack, so to speak. To keep up with the demands of the public, the Ahh! Spot Bean Bag Store regularly comes up with really great designs made from a variety of materials such as denim, velvet, faux suede, cotton and so much more. You can actually choose from the wide array of fabric patterns and colors available or you can also send your own choice of bean bag fabrics that you would want to match the decors in home. If you want to add a more personalized touch to your bean bags, the Ahh! Spot bean bag store also offers embroidery of names or whatever images you would want to incorporate in your bean bag design, which is a perfect gift idea for your loved ones and friends! Still not thoroughly convinced? Then feel free to check out their site, http://www.ahhprods.com/ where you can read hundreds of testimonies from their utterly satisfied clients. In fact, there are a number of celebrities who are raving about their very own Ahh! Spot bean bag. There is actually a lot of Ahh! Spot Bean Bag store products that are featured in many famous television shows such as the American Music Awards, HGTV Designers' Challenge and the highly popular TV series, "Lost". So if you are thinking of buying your own beanie from the ultimate bean bag store, don't be surprised if you ever find an exact replica in one of your favorite TV shows. Ahh! Spot products can guarantee not only the most attractive beans bags but the quality and excellence of its materials that you can expect to last for decades." "Attention Deficit Disorder Resources is a national non-profit organization that helps those with ADD or ADHD achieve their full potential through education, support, and networking opportunities. The AHH! Bean Bag Chairs Store offers bean bag chairs with washable covers and water-repel liners. Bean bags help focus, they let you change position easily while still continuing to work. They are great for kids that fidget in rigid chairs." AHH Spot bean bag chairs were featured in their newsletter as suggested resources for those with ADD or ADHD. We are also named as an ADHD Friend and are listed in their Resource Providers Directory. "Jane Greig - Jane Too! Answers to those odd, basic, short or unbelievable questions"
Q: Do you know where I can buy refill pellets for bean bag chairs? I seem to remember seeing this question in your column in the past, but I cannot remember the source for the pellets. A: Contact Ahh Products, ahhprods.com or (888) 244-6818.